This is a rework of the previous mod. – Changes to rear axle, now it has higher travel and more elasticity. For v1.24 of the game. Don’t really understand french, but I think I got the idea of what were you saying. The GPS it’s work in progress, right now it doesn’t work as I would like to. Hope I’ll fix it soon so I can share it. I was waited for fine physics mod. But yours is the best I found! Great work, nIGhT-SoN! Thank you! Can you tell me, is that a mod that animation on dashboard? Also what is that beautiful sound of a pneumatic when you are breaking? Or that stuff is included in 1.24 update? 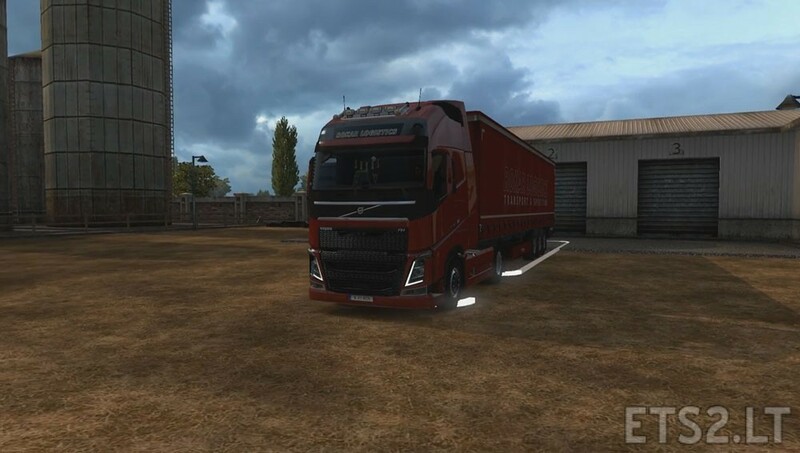 I`m sorry, if that is stupid questions, because I didn`t play ETS2 for a 2 months:) Please reply and answer. What sound truck is this? I’ll try to answer all questions, but first of all thank you for your support! The animation on the GPS is made by me in After Effects, but right now it’s changing on the GPS accessory too, so I must find a way to show the map on the last one. Braking sounds are from Spintire and edited to fit ETS 2. Engine sound is actually DAF Euro 6 sound from within the game, I’ve made my Volvo to use the same engine sound, I think it sounds more like a truck.